– Place 50g wholemeal flour and 50g water into a clean bowl, stir together until fully combined. – Cover and leave at room temperature overnight. – To the sourdough starter add 75g wholemeal flour and 75g water. Stir together until fully combined. – Discard 100g of sourdough starter. Add 100g water & 100g wholemeal flour to the remaining starter. – Stir well to combine all together. Cover and leave overnight. – Discard 150g of sourdough starter. Add 100g water & 100g wholemeal flour to the remaining starter. – The starter should start to smell pleasantly sour with small bubbles appearing on the surface. – Discard 200g of sourdough starter. Add 150g water & 150g strong white flour (all purpose/plain white flour, unbleached bakers flour works well), to the remaining starter. – The starter should appear active and full of bubbles. – The starter should be quite active now and be full of little bubbles and smell slightly sour. – Discard 250g of sourdough starter. Add 200g water & 200g strong white flour to the remaining starter. – The starter should now be very active and full of bubbles. The starter is now ready to use. 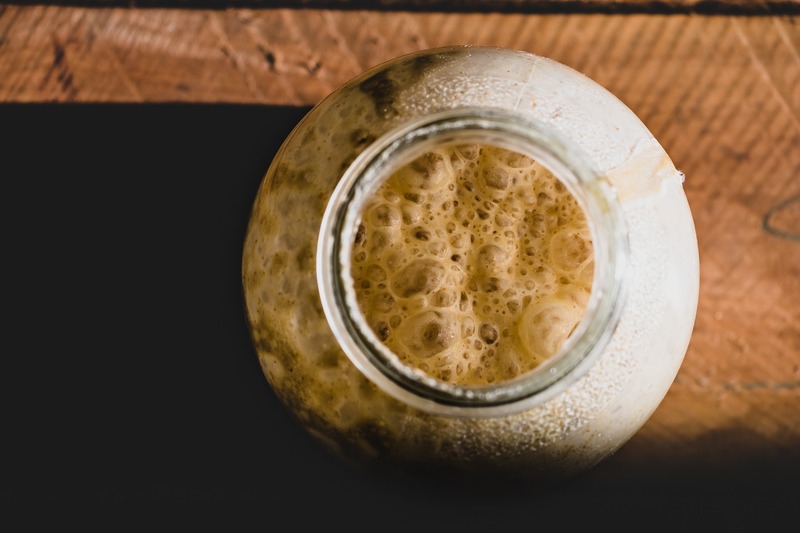 – Remember, when making your sourdough bread always retain some sourdough starter (about 100-150g) which will be fed/refreshed, ensuring you have some sourdough starter for the next dough. As the weeks go by the starter will get stronger for rising. Note: Once I have got the starter to this stage, I keep my starter in the fridge and add about 25-30g flour per day plus water and mix well. Then the night before I make bread I take enough starter (about 150-200g), add about 100g of fresh flour and water, and leave over night ready for bread making the next day. See here for Sourdough Bread Recipe!